Encyclopedia Britannica 2003 Ultimate Reference Suite new in the compact unopened box with 4-CD's. The software has not been used or registered and the box has not been opened. The box is still sealed and has a Best Buy price of $49.99 on the box. The box is the black plastic type 5-1/4" X 7-1/2" X 1/2". 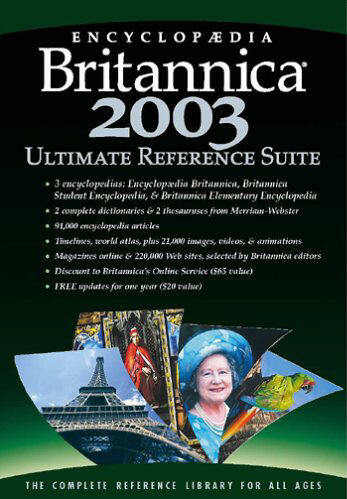 Filled with knowledge on every subject, the Encyclopedia Britannica 2003 Ultimate Reference Suite CD-ROM delivers the 32-volume Britannica collection and more to your desktop. Brimming with more than 91,000 articles, this award-winning four-disc set makes finding information easy for every member of the family, from grade school to graduate school and beyond. This software is not installed on any computer nor has been copied or duplicated. With three reference libraries--one for every age and reading level, Britannica's Ultimate Reference Suite offers just the right encyclopedia, dictionary, atlas, thesaurus, and timeline for every family member. It's all the knowledge anyone needs. For students in upper elementary, middle, and high school, this collection adds the Britannica Student Encyclopedia, with 15,000 entries geared to school. Britannica's Elementary Encyclopedia is written for children in the early grades and designed to instill a look-it-up habit. Also added are two Merriam-Webster dictionaries and thesauruses with nearly 555,000 definitions, synonyms, and antonyms that users can access from encyclopedia articles with a single click. Additional tools include an updated world atlas, timelines, and more. Take a tour of the world through more than 1,300 clickable maps linked to articles. People, events, and discoveries of the past come to life on 25 timelines with 6,900 points linked to related articles. Britannica's exclusive Knowledge Navigator tool, an interactive browser, is perfect for creative brainstorming, discovering new ideas, and exploring different topics. Rounding out the collection are some 21,000 images, videos, audio clips, and animated maps, as well as a clever research organizer. Knowledge Navigator - a unique interactive browser made for creative brainstorming, discovering new ideas, and exploring new topics. Research Organizer - designed to help manage research in progress, this feature includes special tools that allow users to enter notes, save bookmarks and pictures, and format reports. We can ship this book through USPS using media rate to save you money. Please email us that you want to ship this item with or without insurance using media rate and we will email you the total shipping charge. We need your state and zip code or country to give you the shipping cost. Or use our standard shipping charge on our shipping page.